Durango has long been considered the scorpion capital of Mexico (even the local soccer team became known as Los Alacranes, the Scorpions). At one point in the past, the city paid a bounty for each scorpion killed. Some historical accounts suggest that the scorpion catch rose dramatically, until the local authorities realized that some families had started their own financially lucrative scorpion-breeding programs. These days, few scorpion stings are reported in Durango, partly because Durango’s scorpion hunters (alacraneros) catch and kill thousands each rainy season; prime specimens are encased in souvenir key rings and wall clocks sold in the local market. They also supply medical research labs. Research in one lab at the University of California has isolated several peptides that appear to suppress the immune system, promising another way to prevent transplant rejection. Lourival Possani, and his colleagues at Mexico’s National University (UNAM) have discovered a toxin (named scorpine) in scorpion venom that slows down the growth of malaria parasites in fruit flies; if similar techniques work in malarial mosquitoes, it may be possible to dramatically reduce the spread of malaria. About 250,000 people in Mexico are stung by scorpions each year—more people than in any other country. Several dozen people die each year. ﻿Indeed, for the past 20 years, scorpion stings have been the leading reason in Mexico for deaths due to adverse reactions and poisoning caused by venomous plants and animals. There are more than 200 different species of scorpions in Mexico, of which only 8, all belonging to the genus Centruroides are a significant public health risk. 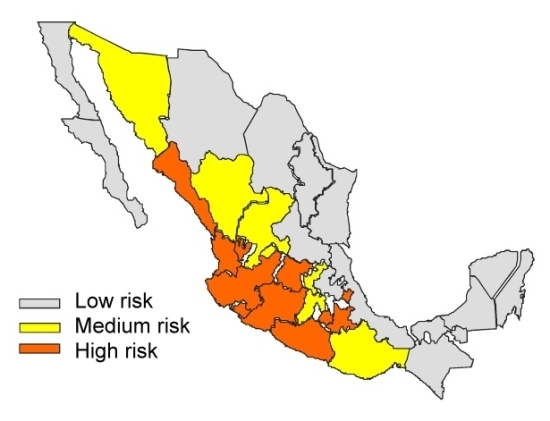 The map shows the areas defined by Mexico’s Health Secretariat as being of High, Medium and Low risk for dangerous scorpions. Fortunately, progress is being made. The number of recorded deaths from scorpion stings  has fallen from more than 1,000/year in the 1950s to 285 in 1995, about 80 in 2003, and 57 in 2005. This improvement is the result of public health campaigns stressing the importance of seeking emergency treatment and of the development of antivenin serum (known as Alacramyn in Mexico and Anascorp in the USA). Mexico’s antivenin industry, led by the Bioclon Institute, is world class, exporting serum to the USA and Australia as well as throughout Latin America. The biggest threat from scorpions comes from central and northern states in Mexico, including several along the Pacific Coast: Nayarit, Jalisco, Colima, Michoacán and Guerrero. 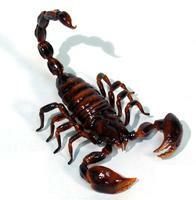 According to UNAM’s Biomedical Investigation Institute, 277,977 people in Mexico reported scorpion stings in 2010. In the first five and a half months of 2011, 98,818 people in Mexico have been stung. The five states with the highest incidence of reported scorpion stings are: Jalisco (19,995), Guerrero (15,769), Morelos (13,123), Guanajuato (12,326) and Michoacán (10,597). The incidence of scorpion stings rises sharply in summer when higher temperatures encourage scorpions to leave their lairs and go exploring. Q. What other factors, besides the ones mentioned in this post, might help explain the pattern of risk shown on the map? Hint – can you think of things that the states shown as “high risk” — or the “low risk” ones — have in common? A Google search using the terms “scorpion”, “deaths” and “Mexico” finds dozens of websites all claiming that ﻿“In Mexico, 1000 deaths from scorpion stings occur per year.” This includes the two highest ranking sites in the results here and here, for articles dated 14 April 2011 and 20 August 2009 respectively. Given that 1000 deaths/year from scorpions has not been true for 20+ years, perhaps it’s time for these sites to update their data by referring to Geo-Mexico! I moved to Aguascalientes, Mexico from Wisconsin last October. We have killed several scorpions in our home since arriving here including one that was crawling up my leg. Fortunately I was not stung but it is just a matter of time before someone in our family of 5 will get stung considering most of them we found in our home is in a bedroom at night. Do you have any advice to offer in regards to how to keep them from getting in the house such as replant? My husband has sealed around all the windows and put sweeps under all the doors he even plugs the drains at night. Sorry to hear you have a scorpion problem. I’m afraid I don’t have any suggestion beyond asking your neighbors what they do and what works for them. Small comfort probably, but scorpions will not usually sting unless they feel really threatened. Basically, they want water.They will crawl under doors, climb wall and get in through windows, and live in tiled roofs. If you’ve screened the windows and put sweeps under doors, and stopped the drains at night, and during the day, used a plug after you’ve used the sink, and caulked all small holes in the house, that is a great start. Check any fan or dryer or a/c exhausts–seal around all vents. You’ve got to thoroughly check every nook and cranny in the house to make sure you’ve gotten rid of all that are already inside, and caulk crevices in woodwork, closets, around plumbing, doorways or windows, behind cabinets,light fixtures, light switches, baseboards, recessed lights, and ceiling fans, and any place where wires or pipes enter the house. Check under stove and fridge. Clear loose debris, rubble, wood, anything else they can crawl under, such as compost heaps, rocks. Prune shrubbery, and if you have grass, mow it and keep it mowed. Leave nightlights on in bathrooms and, of course, use netting around the beds. Always check shoes and slippers. Personally, I avoid poisons, since they are all carcinogenic. If you’re not allergic to dander, a good mouser-cat–not the lazy kind–is a godsend. They will get all that venture inside. If you have room outside, I highly recommend a few chickens–they eat all bugs. Make sure the house is always clean, no food around for insects, which is what scorpions eat, and no access to water in the house.